Yoshi’s Crafted World arrived at the perfect time. I came to this game straight from Sekiro: Shadows Die Twice, the infamously hard ninja action game from the brutal bastards at From Software. As you’ve maybe heard, Sekiro is not the most easygoing of videogames. It exists as a monument to death and the endless negation of the player, matter-of-factly dispatching me with no mercy again and again and again. Far more vexingly, that difficulty inspired the umpteenth round of debate over easy modes and accessibility and the “git gud” mindset, which pretty much made me want to tune all the way out of the games scene once and for all. But Paste has bills to pay and I have a mortgage and thankfully my old friend Yoshi came around when he was most needed and made me look forward to doing my job again. Thanks, Yosh. I can’t say this enough: I like things that are cute. I like games that are bright and sunny and happy and act as an alternative to the tiresome pallor and adolescent angst that too many players and developers mistake for maturity. Sekiro wasn’t guilty of any of that—I endorse that game unreservedly, both its unforgiving action and its feudal aesthetic—but most of the big names games we’re expected to cover here are. Talking about how cliched big budget game design is became a cliche itself over a decade ago. Nintendo has always been an antidote to that, and it’s come to the rescue one more with Crafted World. So we’ve got what looks like a stuffed dinosaur with those idealized neotenous features, casting out warm invitations integrally linked to our earliest toys (and thus earliest memories) from childhood. It’s trucking along in a little papercraft Hot Wheel, on top of a windmill that seems to be made of yarn and cardboard. Bright happy trees sun in the background, with the whole scene looking like an arts and crafts project a substitute teacher would give us to kill time in elementary school. It’s so adorable I almost want to cry. Every screen of this game feels like this. Every screen taps into a primordial source of joy within me that’s too often buried over and covered up by the stresses of adulthood and the utter joylessness of most major videogames. Yoshi’s like a concerned friend waking me up from a nightmare of mirthless grim and gritty nonsense. This alone is enough for me to wholeheartedly embrace Yoshi’s Crafted World. It could have the most mindless, rote and uninspired play this side of Cow Clicker and I’d still gladly crank it up on my Switch as a nightly palate cleanser. Thankfully it’s not mindless or rote—although it might be a little uninspired, and a targeting mechanic where you have to stop to aim and throw eggs at enemies or various background obstacles is a bad idea that stops everything dead in its tracks. These Yoshis might scurry about in familiar and predictable ways, but there’s more than enough charm in how this world looks—and how we can interact with it—to make up for that. Yoshi’s Crafted World is almost a kind of therapy for me. It’s like gaming detox. When I was fully overwhelmed by the stress and frustration of Sekiro, a retreat to the warm environs of this beautifully crafted world made all the difference. 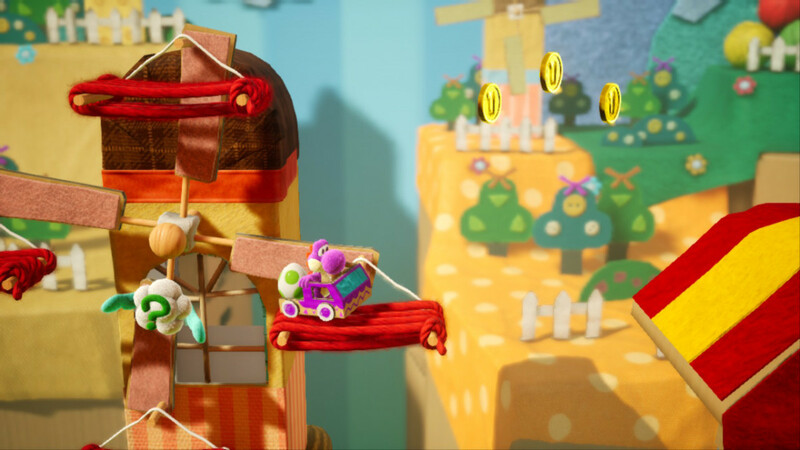 To use a metaphor that Yoshi’s presumed target audience has to be too young for, Yoshi’s Crafted World is the soothing chaser to the harsh shot that is Sekiro. The two have nothing in common beyond the fact that they are both videogames, but they unintentionally complement each other so well that I can’t really imagine playing one without the other now. And Yoshi’s Crafted World will no doubt have the same palliative effect when combined with any angry, serious violent spurt. It’s a game for all seasons and emotions, and almost entirely because of that glorious grade school aesthetic. And get this: I didn’t even mention the little stuffed dog that Yoshi can ride on. Like, this game is already heart-melting enough, and then that guy shows up, and at that point it almost becomes too much. 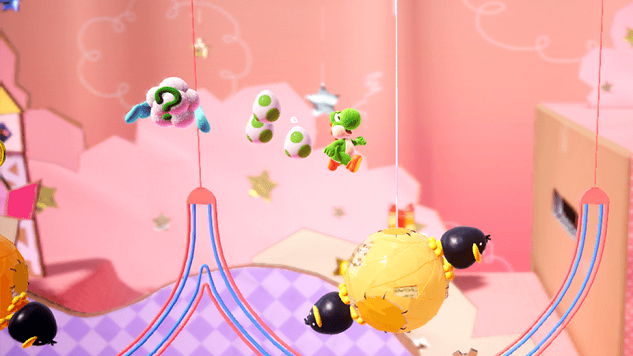 If From Software replaced brutality with cuteness, the result would be Yoshi’s Crafted World.